Chalk: a paper that has been coated with a chalk solution in order to prevent the washing and reuse of the stamp. This coating is water soluble, so if you soak a stamp printed on chalk paper, the inked design with come off. To test if your stamp is chalk-coated you can rub a piece of silver wire on it–if it’s chalk paper the silver will leave a black mark behind. Of course, that will ruin your stamp! So, my advice is that if you suspect your stamp is on chalk paper, just leave it alone. Also, never soak it to get it off paper, just trim around the edges and mount it on paper. Coated: a coating applied to the paper to give it a glossy appearance. 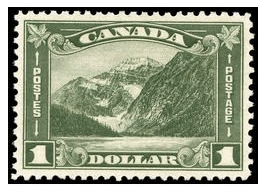 Early Canada stamps were printed on uncoated paper, which is why they often look dull and washed out. Laid paper: stamps printed on laid paper, when held up to the light, show discernible light and dark lines. This is accomplished by impressing wide, parallel, horizontal or vertical wires into the pulp as it settles on the screen. The pulp in-between the wires will settle and dry in a thicker layer and show up as a darker, more opaque paper against a light source. Basically, the «lines» of laid paper are bands of subtle differences in paper thickness. Pelure: an extremely thin paper that is semi-transparent and very fragile. It is sometimes also called «onion-skin». Ribbed: a finely lined paper with a corrugated texture on the paper itself that can be felt when you rub a finger across it. Some Canadian stamps are printed on ribbed paper. Tagged: stamps printed on luminescent paper, or with luminescent ink marks added to the paper as a security measure or to position envelopes correctly for cancelling when sorting mail by machine. The tagging can be detected with the use of a UV light. Watermarked: a paper that has a design in the actual paper. During the paper making process, bits of wire in a certain design are added to the mesh screen or Dandy roll. As with laid paper, less pulp accumulates where the extra wire is, thinning the paper and making that part of it more translucent when held up to a light or dipped in watermark detector fluid. A watermark can take the form of a graphic design or letters. Each stamp on a full sheet of stamps may have an individual watermark, or show parts of a larger watermark that was made to cover the entire sheet. Wove: a commonly used paper. The pulp is deposited and spread evenly on a fine, wire mesh screen. Once the water had drained away and the paper has been pressed and dried, you’re left with a paper of very smooth and uniform texture with no discernible marks on it. Thanks for the article. Will add to my info base. Looking fwd to article on cancels ie What is a “moon” cancel? It was advertised on one site but appears to be a rectangular shape cancel.